After getting some heavy press leading up to his attempt to ebay off sponsorship of himself, a leading British sprinter named James Ellington it appears has already met his reserve price in less than 9 hours. According to the auction site, 54 bids have already been placed with the current high bid coming in at £30,300.00 with 9 days left. Listed under Sporting Goods, Ebay classifies Ellington as "an unused item with absolutely no signs of wear," though it does say there may be "minor defects." Any guesses as to who the winning bidder was? 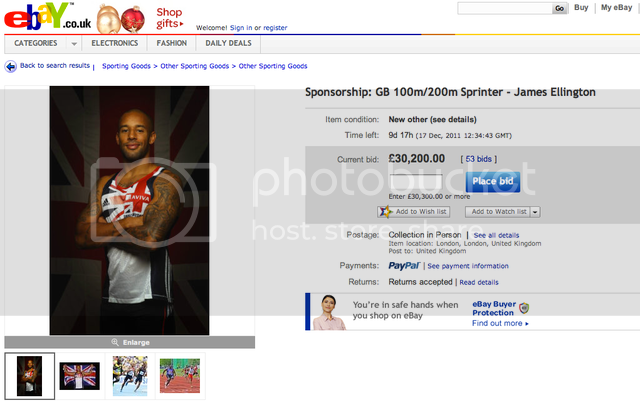 James Ellington – internationally renowned GB sprinter – is seeking a sponsorship deal. As the country’s only top sprinter without a sponsor, James has turned to eBay for vital funds, without which he risks being left behind his international competitors. Four years of serious injury meant James – a 100m, 200m and relay sprinter – slipped down the rankings, and has been passed over by the major sponsors who were looking for long-term tie-ups. Now James is rounding off his best ever season, running 200m in the fastest time by a British athlete this year at a non-altitude venue (20.52 seconds) – without receiving a penny from a commercial business. Sponsorship is vital for James to be able to commit full time to his training – enabling him to run the fastest times ahead of next year’s Olympics, secure his place in TeamGB and hopefully win a medal for his country. To train round-the-clock like his rivals, James needs a £15,000 wage and a further £15,000 for expenses to cover everything from travel and accommodation to nutritional support and kit. His eBay reserve sits at £30,000, for which James will wear the sponsor’s branded kit at every possible opportunity where appropriate, including at training and press events, until after the 2012 Games. The UK Athletics World Class programme provides James with a financial contribution to help with everyday expenses and pays his medical bills, but it’s commercial sponsorship he needs to put him on a level playing field with his peers and rivals. Other than that funding, James is dependent on the money he gets from coaching under-privileged kids in South East London and supporting young athletes. James has represented Great Britain at the World Championships in Korea and was part of the victorious GB relay team in this year’s European Team Championships, leaping up the rankings ahead of the majority of Britain’s established star names.